Objective: Work safely around electricity on the job. Review the information below on electricity, hazards, and safety guidelines. Demonstrate proper and improper grounding. Explain the difference between 120-volt and 240-volt outlets using the illustration. Have workers inspect and test power tools for proper grounding. Also, demonstrate a Ground-Fault Circuit Interrupter (GFCI). Electricity always follows one or more paths of least resistance. Electricity follows a nonstop path. If the body becomes part of a path, electricity will pass through it. Dry hands and feet offer more resistance to electrical current than wet hands or feet. But the current can be lethal in either case — especially if the electricity passes through vital organs like the heart or lungs. Grounding electricity means creating an easy path for the current — one that doesn’t include your body. Have only a qualified electrician perform electrical installations or repairs. Moisture and electricity must never mix. Electrical fires require a type C fire extinguisher. The diagram below shows a 120-volt (120V) outlet and one type of 240-volt (240V) outlet. Electrical power tools should have a true ground. Otherwise, they should be double-insulated. For example, a drill has a third wire incorporated in the design. This third wire acts as the ground wire. This means the current will follow the ground wire — not the operator. Usually a three-prong plug in a three-hole outlet provides a proper ground. Never cut off the third ground prong. If you have an old system with only two-prong plugs, it is not properly grounded. In that case, you must use an acceptable double-insulated electric power tool. Never use a spare piece of wire attached to a pipe or outlet housing as the ground. If a power tool develops a short, repair it before using it again. Inspect wires and plugs on power tools before each use. Repair or replace damaged wires or plugs before using the equipment. Do not tape over gashes. Instead, replace the wire. Do not splice wires. Extension cords are for temporary use. Have permanent wiring installed where needed. Where an equipment cord plugs into an extension cord, tie a half-knot to keep the plug from pulling out. Where extension cords are used outdoors, they should be rated for outdoor use. The electrical load should not exceed the rated capacity. Use only one extension cord. Never use an electrical power tap or power strip for landscape and horticultural use. It is too easy to overload it. It may melt. Shield plugs and outlets. Protect plugs and outlets from moisture in the environment. Never leave a plug connection in a puddle or other collection of water. Only use one hand when touching plugs, outlets, or anything metal in a greenhouse. Water and electricity are both abundant. If you touch with both hands, the electric charge can pass across your heart. You could be electrocuted. You could die. Overloads can cause fires. Circuit breakers protect the wiring system from an overload. They do not protect people. A Ground-Fault Circuit Interrupter (GFCI) is specifically for personal safety. A GFCI can be hard-wired into an electrical box. A portable GFCI can also be plugged into any electrical outlet. 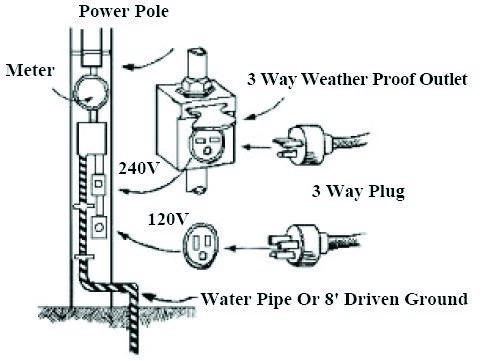 If there is an electrical short, the GFCI prevents an electrocution. Electricity always follows one or more paths of least resistance. Only electricians should make electrical installations or repairs.